Participants who were part of the Pastoral Development Program. Our prime ministerial training program is called the Pastoral Development Program (PDP) and it ran for 10 days from Oct. 29-Nov. 7. 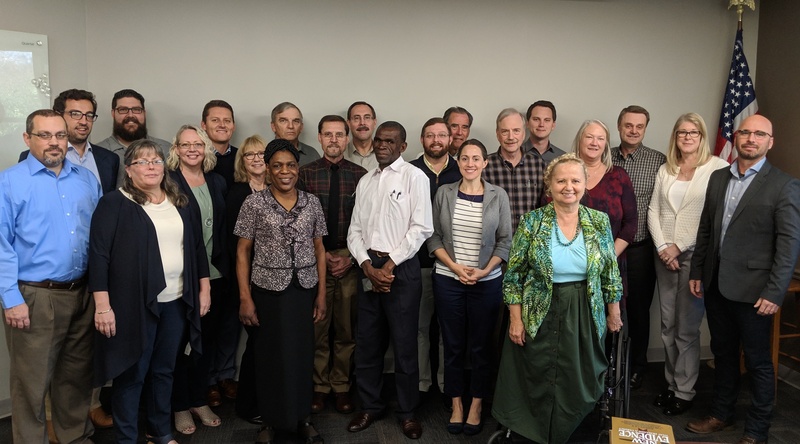 Home office personnel shared their time with an enthusiastic and attentive group of 23 people from Australia, Canada, the United States and Zambia. Non-ordained ministerial trainees were included with the hope they will become ordained congregational leaders soon. Some newer in the ministry also came for enrichment. The PDP featured lectures on techniques for better serving as ministers, but also discussions about character and integrity. We recognize it is important not only to be skilled in speaking, visiting and organization, but also to be ever-mindful of personal integrity. Most of the qualifications for the ministry—as the apostle Paul clearly brings out in 1 Timothy 3—deal with matters of character. Furthermore, an elder is responsible for creating a caring and helpful environment in his congregation: “Not for that we have dominion over your faith, but are helpers of your joy” (2 Corinthians 1:24 2 Corinthians 1:24Not for that we have dominion over your faith, but are helpers of your joy: for by faith you stand. American King James Version×, King James Version). Wives were also included in all lectures and participated in the discussions since they are essential to our ministry. They also held a few separate meetings. Practical speech labs were also held to provide speaking evaluation by the group. One afternoon most of the group went on a hike at the nearby Cincinnati Nature Center. Every day we had two or three couples give a short “getting to know you” presentation in which they shared biographical information about themselves. On the weekly Sabbath most of the participants traveled to neighboring congregations and gave split sermons. The PDP has become quite the event here at the home office as the Ministerial Education Team can see what God is doing in the lives of His servants for current and future service to His people. From Dec. 9-11 the last of a series of six regional conferences organized by the Ministerial Education Team was held in Temecula, California. There were actually two groups, one on Sunday, Dec. 9 for 130 congregational leaders and then separately for the ordained ministry. The ministerial conference was preceded by a Sunday leadership workshop that was open to everyone to hear home office presenters speak about the dynamics of Christianity. Lectures covered the first expansion of Christianity from Jerusalem to Antioch, making disciples by first becoming disciples and then reaching out and lighting the way for others to become Christians. All serious-minded older teens, young adults, adults and seniors of either gender who were interested in greater service to the Church were also invited to this workshop. Ages of participants in the recent workshops ranged from 16 to 99. One key presentation was given by Tim Pebworth titled “Pastoring Young Adults and Building Relationships.” It addressed the needs of a significant demographic in the Church and explained how this sizable and energetic group tends to think, how we can better communicate with them and how they can become more engaged in the work of the Church. Another presentation, titled “The Hassle with Tassels,” was given by Steve Myers and covered the subject of the covenants and what Old Testament laws we keep or don’t keep and why. A few first-time presentations were also given. In their unique and engaging style, Randy and Kay Schreiber spoke together about “Principles of Effective Counseling.” Regional pastor Jim Tuck held an interactive session about how elders can effectively help their pastor. MMS Operation Manager Mark Welch spoke about integrity, humility and unity in the ministry. Mario Seiglie brought some lessons from sheep and goats. Darris McNeely concluded with the topic of being an “elder at the gate.” It was about upholding the office and dignity of our role as elders and being there for people to come to.